While Jesus and his followers were traveling, Jesus went into a town. A woman named Martha let Jesus stay at her house. Martha had a sister named Mary. Mary was sitting at Jesus' feet and listening to him teach. But her sister Martha was busy doing all the work that had to be done. Martha went in and said, "Lord, don't you care that my sister has left me to do all the work by myself? Tell her to help me!" But the Lord answered her, "Martha, Martha, you are getting worried and upset about too many things. Only one thing is important. Mary has made the right choice; and it will never be taken away from her." In an age when Rabbis didn't even talk to women in public—much less teach them and enter into Bible study with them—Jesus broke all the rules. In John 4, he visits publicly with a woman who was also a (despised) Samaritan woman and through her he reaches her whole village. 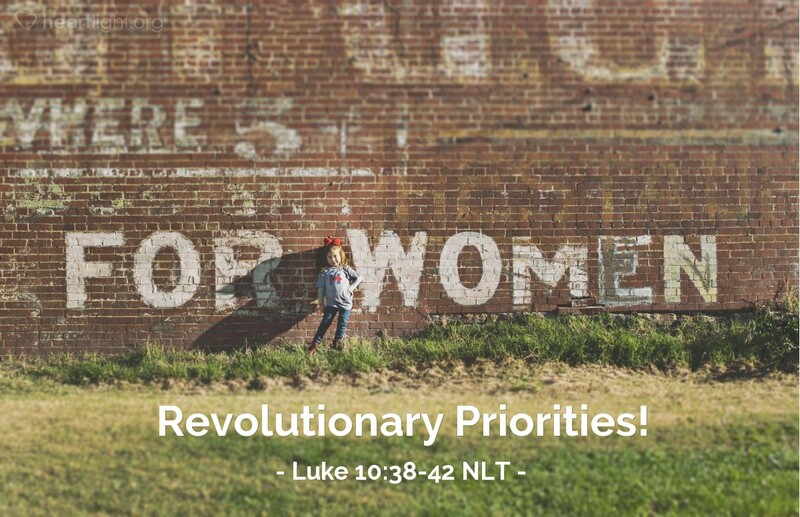 In Luke 10, Jesus not only discusses and teaches God's word with a woman, but he emphasizes that this is the one crucial thing about which she should be concerned. Women are not only given the opportunity to associate with and learn from Jesus, but just as the men are, they are also told that this is the primary concern—to know Jesus, his words, and his kingdom. Father, please let nothing hinder me from placing Jesus first in my life. Please use me to influence all those in my family to see that this should be her or his primary concern. In Jesus' name I pray. Amen.